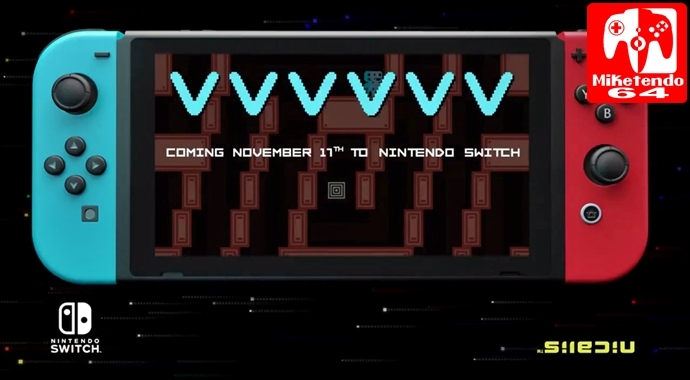 SANTA ANA, Calif., October 23, 2017 — Nicalis, Inc., video game developer and publisher, announces today that the crazy fun gravity-switching saga VVVVVV will release on the Nintendo eShop for digital download on November 17. It will carry a price of $9.99. The Switch version of VVVVVV runs at 60 frames per second, with bright and colorful throwback graphics and a number of graphical filters to change the visual aesthetic. The supremely catchy chiptune soundtrack will stay in your head for hours after you stop playing. Developed by distractionware and Nicalis, Inc., VVVVVV will be available for Nintendo Switch on November 17 as a digital download from the Nintendo eShop for $9.99 (North America) or €9,99 (Europe). The game has been rated E by the ESRB.